Chatter starts to simmer down as the eighth-period bell rings and students move to their seats and prepare for the last lesson of the day. The teacher stands in the front of classroom setting up the Smart Board, the students’ eyes focused on their computer monitors as they tap, tap, tap away at their keyboards. The sound of rapid clicks and some logins later, the class is engaged and ready to learn. The lesson is to take an object, or two-dimensional sprite, as they are known in computer graphics, they created with Scratch, a visual programming tool, and manipulate it to make it spin. One female student took the assignment steps further, making a basic race-to-the-finish game with the space bar and arrow buttons as controls. Computer science is among the most in-demand fields, with jobs projected to grow by as many as 4 million by 2024, but only about 40 percent of schools offer computer science courses and fewer than 4 percent of all college graduates earn computer science bachelor’s degrees. Project Lead the Way, now in its 20th year, is trying to improve those numbers by creating K-12 computer science, biomedical, and engineering course electives like the one being used at Hillside High School, one of more than 10,000 schools across the country that teach the nonprofit’s STEM curriculum. More than 2.4 million students are currently enrolled in PLTW classes. “What’s the rule in this class?” Knowlden called out as she moved to the center of the room. Students responded unanimously , “Ask three, then me,” as they shuffle their seats to group into pairs or trios. The class is a mix of grades 9 through 12 with male and female students. 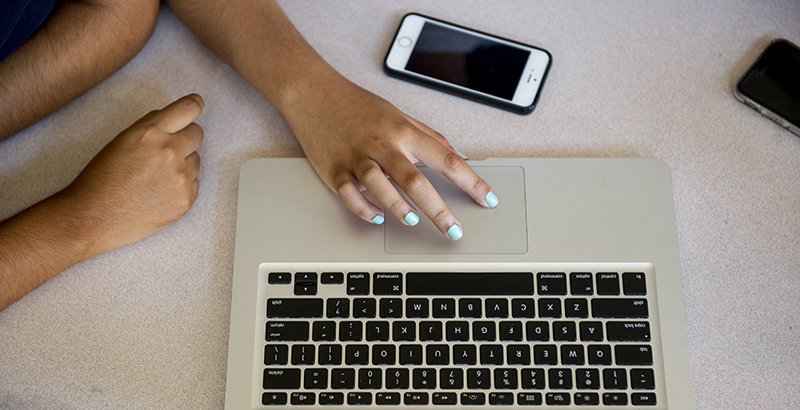 In the real world, blacks and Latinos hold barely 5 percent of tech jobs and women are largely underrepresented. At Hillside High School, a 900-student campus, 71 percent of students are black, 19 percent are Hispanic, 9 percent are white, and less than 1 percent Asian. However, the underrepresentation of minorities in computer science isn’t about lack of interest, it’s about lack of access, Project Lead the Way believes. This is Hillside High School’s second year of offering PLTW courses, and in Knowlden’s class alone, enrollment nearly doubled, from nine to 16, since last year, largely, she said, because of student word of mouth. The number of girls went from one to five. The course is game-based, and students are expected to create games to be played by the rest of the school during the Fall Festival at the end of October. Classes are more self-guided, and the teacher facilitates the learning rather than students passively absorbing information. Students struggle with the advanced, college-level curriculum, Knowlden said, but she encourages them to work through their mistakes. Project Lead The Way teachers — Knowlden is one of 37,000 using its material — endure intensive training from master teachers to learn the lessons from the student perspective. PLTW says it provides training resources and ongoing support for over 14,000 computer science teachers across the country — completing more than 1,300 training sessions during summer 2017 alone. The cost of PLTW computer science courses for districts ranges from $700 to $3,500. The organization partners with different government agencies, philanthropic groups, and corporations, such as Verizon, which provided a $5 million grant, partly to train middle school teachers in 240 schools in 36 states, and recently pledged $3 million more to PLTW. “Engineering club today, don’t forget,” Marc Aranguren says as eighth period ends. Aranguren teaches two PLTW courses: introduction to engineering design and principles of engineering. 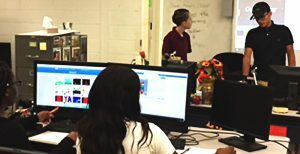 Some students in the PLTW computer science class also take engineering or participate in the high school’s non-PLTW after-school engineering and robotics club, which Aranguren also runs. “Friday is a tough day to get kids to come,” he chuckles. The engineering and robotics club team is set to compete in an Oct. 20 pumpkin-sling competition at Picatinny Arsenal in nearby Morris County. Last year, the competing team built a catapult that launched a pumpkin 60 feet into the air. Teachers say they witness other positive benefits of students engaging in STEM classes beyond grit and critical thinking skills. Knowlden and Aranguren agree that the biggest change within their students is the camaraderie they develop when they work off one another. In the after-school club, the students were eager to work on their catapult design. Some are even contemplating engineering as a career. “Raise your hand if you’re a senior.” Aranguren called out. All hands went up. “How many of you are going to college?” a visitor asked. All hands went up but one. “Jeffrey, put your hand up,” one student yelled while the other students laughed. Jeffrey laughed and raised his hand, too.